Yes we did 🙂 With some influence from our two year old daughter as you can probably tell……. The Dora one is particularly scary! I find any five year old whose only chaperone is a boot wearing monkey to be scarey! Those turned out awesome! Love the Dora pumpkin! Fantastic job!! I wish I was that creative when it came to carving pumpkins. These are awesome pumpkins! I love the Dora one! That is SO cool! LOVE IT!!! WOW love it, especially that awesome tree! Fantastic Job. We did not carve pumpkins this year, but my daughter would have been in love with the Dora and Hello Kitty! Yep we did them all. We just used stencils that I found online. Great pumpkins! I love the one with the tree character. What a wonderful blog. So sweet to hear the voice of a mommy who works outside of the "box". Hello! Love your pumpkins. Found your blog through Create With Joy. 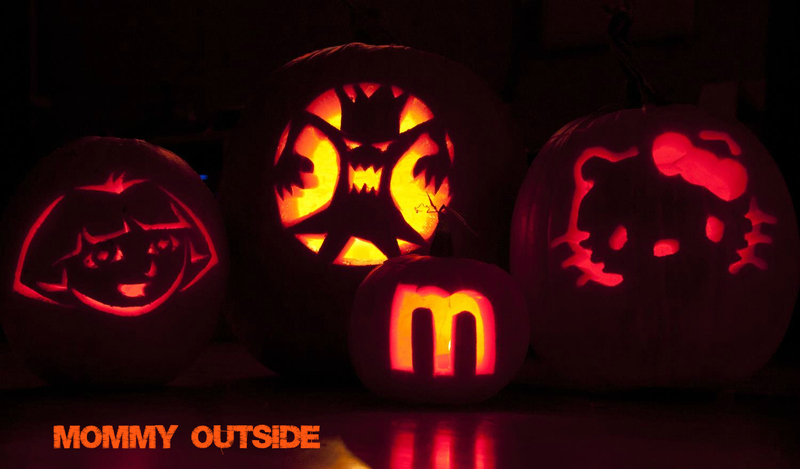 We carved several different pumpkins like that with the neighbors. Ours didn't all turn out as nice as yours! !